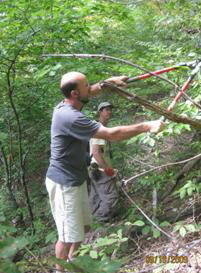 Every 3rd Saturday of each month, the HHC sponsors official trail building and maintenance events. It has been through this avenue that trails such as the Tecumseh Trail, Adena Trace Trail, and others listed on our Trails page were built. No experience or tools are needed – we are happy to train new members, and will supply all tools needed. Check out our Trail Work page to learn more about these trail work days. About a week before each 3rd Saturday work day, we send out an email to our active trail-building volunteers which provides details on location and the work to be performed. 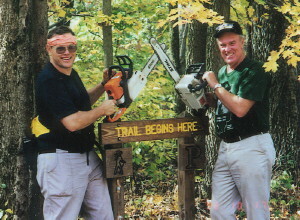 If you are interested in trail work, contact us to let us know you’d like to be added to our email list! The HHC collaborates with the Indiana DNR to manage an Adopt-a-Trail program for trails in Morgan-Monroe State Forest and Yellowwood State Forest which includes the Tecumseh Trail. This program assigns 1-3 mile sections of trail to volunteers who are asked to walk the trail on a quarterly basis to prune brush, clear obstacles, remove debris and litter, and report trail conditions, most often logs that need to be cleared from the trail. Monitors use an evaluation form to record trail conditions and submit it to the HHC Adopt-a-Trail Coordinator. To find out about responsibilities, training, and how to sign up for a section, contact the HHC at mlwilcoxson@gmail.com. 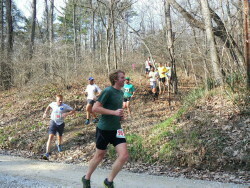 The HHC is always in great need of volunteers to help man various roles in their two annual trail races. Aid stations are located every 2-3 miles, and volunteers are needed here to provide drinks or food to trail runners. Traffic directors are needed at all road crossings to ensure runners cross safely and follow the correct trail. Flaggers are needed to tie ribbons at frequent intervals along the route. If you have leadership experience, there are many opportunities such as Aid Station Managing Director, Race Director, and other challenging roles which may be available. Contact us for more information, or to sign up! 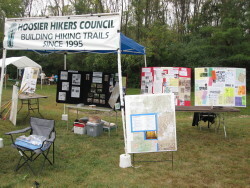 The HHC participates in outreach events when we can, such as the Hoosier Outdoor Experience (HOE). If you are interested in helping to man the HHC booth for such events, contact us! Being a small nonprofit organization run entirely by volunteers, the HHC can always put to good use just about any skill or expertise! Do you have good computer skills? Photography? Wood-working? Leadership or coordination? Writing? Creative, drawing, or other art skills? Map making? Construction? Tool-making? Event planning? Public speaking? Whatever your skill or desires, we can probably find a good fit within HHC! Email or call us toll-free at 1-855-812-HIKE.